Full view if you're going to comment, please. 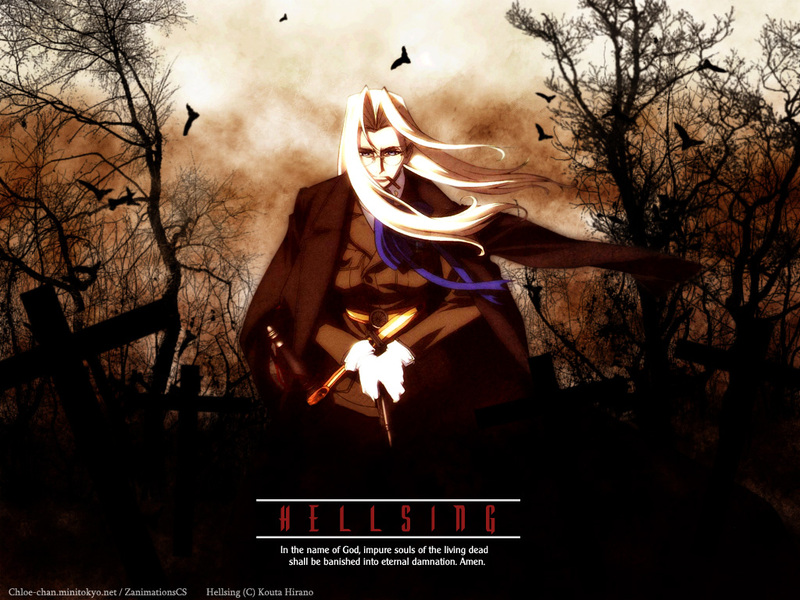 Well, I was browsing through APs Hellsing scans, and I found this really cool Integra scan (which was from an OST, I believe) and I just had to wall it. It was difficult to clean, but I did my best. Did I spell her name right? Integra? Textures from DA!. The crosses (I dunno if you can see them) were vectored. Oh yeah, is the font centered? Edit: Changed the font as well as removed most bats. nice job, love the background and the scan, its very dark and the textures look nice too, great job, ja! Oh yes I love dark walls too and this one looks GREAT! I really luv the cool looking background! Awesome work! XD I REALLY REALLY LOVE THIS! so original omg awsome! +favs! great wall Chloe-chan, Integra is one of my favoite femail characters.. The leaves in the alternate version doesn't quite fit in with the color schemes you used for the rest of the wall. They are too bright. The bats, however, blend very well with the tombstone crosses. Since they are also silouetted, they fit perfectly in with the dark colors. Though I would consider using fewer of them to give their use greater emphatic meaning. The two flocks on the left and right seem to crowded. I think one or two lone bats flying off would make it much more eery. I also agree with bluSake that the text is a bit too plain. The times roman styled doesn't quite work well with the theme of Hellsing. I seem to feel that a more "Gothic" font is perhaps perferable in this context. the test needs some work; as mentioned above it's a little too simple, too unincorporated into what otherwise is a great wallpaper. Again, as mentioned above (by BluSake); this s an extremely striking wallpaper; positioning of Integra anywhere but the center would have been sheer folly; and the trees flank her so perfectly that it almost seems as if everything was one image - a desirable effect in a wall like this. everything but the text is perfect; really. perhaps adding a slight texture over the text and an outer glow would work well in such a wall. WOW! Awesome! B) Love it! wOW!...nv really seen an wall on Integra...u did a nice job protraying her mysterious Side of her....though the txt i dun realli find it matchin...but it is certainly a great pic...great work! Really nice work chloe-chan! ^^ I think the mood is great and very fitting. I like the scan and how the background blends. I really like that textures the scan seems to have and the crosses look great. I think the bats are a really great detail and I love the colors! ^^ Good work!